Let’s say you got a little bit of money under your belt and are debating on whether to plunk down your hard-earned bucks as a down payment on the tiny run-down shack on the ritzy part of town or on the average bungalow in move-in condition in the modest part of town. Before you fall for your broker’s mantra of “location, location, location!”, there’s something I need to tell you. The answer all depends on whether you can afford living in your new community and partially perhaps, on whether you can actually stand your neighbors. So let’s say you decide on the nice little fixer upper in the rich part of town. You celebrate and live it up thinking you have arrived, but your elation becomes short-lived because you realize that eventually you’ll need to start worrying about the work and budget involved in bringing the house up to par. After that, anxiety could begin gnawing at you as you think of the ongoing commitment of living in this place: the mortgage, the property tax, the high priced premiums you got to pay to shop in the gourmet stores and boutiques that surround you. And what about who lives close by; could they possibly care more about their orchids, luxury vehicle or their pedigreed pet than who lives in the tear-down next door? What’s it like to live in a wealthy neighborhood when you can’t afford it? Not just lonely. Could it also actually be hazardous to your health? I pondered this, after reading this article about the plight of lower income people living among their rich counterparts. 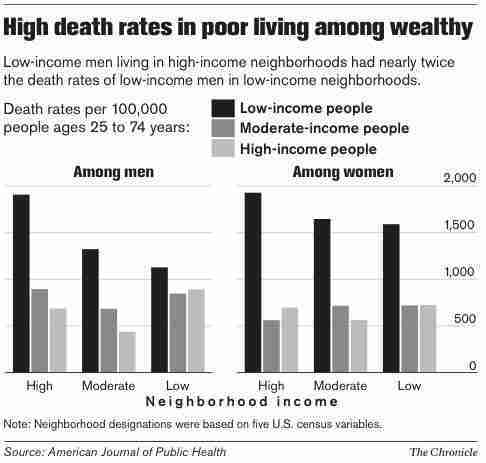 A study conducted in Salinas, Monterey, Modesto and San Luis Obispo, CA by the Stanford University School of medicine has discovered that low income people in a sea of rich folks ended up dying earlier than their peers living in lower income areas. These relatively poorer folks are usually people who were old-timers in a neighborhood that became more affluent with time, or are those who service the rich who live there. Either way, it appears that being out of your comfort zone most of the time, or being the small fry in a big pond will not bode well for your health and well-being. The hard numbers show that if you are the small fry, you have a 70% higher risk of dying than the rich who live with you. Feeling out of place can make the less affluent feel isolated and disconnected from everyone else around them. The poorer folk pile on additional work to afford the goods and services around them, often working several jobs to sustain their lifestyle. In fact, there may be additional pressure to afford the more expensive things they are surrounded with. It appears that loneliness, and perhaps even envy and the stress of keeping up with the Joneses can really be a bear. So if you are financially challenged, could it be that in order to avoid risking shortening your life, then you should stay downsized? But this sure goes against the grain of human ambition. Nevertheless, I wonder whether the results of such a study can translate to similar scenarios for folks who live in a place where they feel they don’t belong — perhaps such as foreigners or aliens in strange lands. Could it be any different if you live in such a place where you stand out by being different in color or size or gender or orientation? Perhaps… after all, it’s money we’re talking about here, and maybe, just maybe, if you could just have more of it, it could serve as a salve. Cheap Housing Option: Buy A Mobile Home! What is strange is that while there appears to be a correlation between death rates amongst low-income and the income level of their neighborhood, the same doesn’t hold true for Moderate Income folks….weird. Also, I would be interested to see what the cause of death was amongst the low-income folks. Are they dying of diet-related illnesses or something else? This is definitely an interesting study, but I am still not convinced that lack of social “community” is a major contributing factor for higher death rates for the low-income group. Hi Ravi! True, it is all speculation what does cause the higher death rates. It could very well be other lifestyle or living habits doing people in. However it did get me thinking of how stress and loneliness and a lifetime of frustration can play a part in ones’ early demise. I suppose if you have moderate income, you can just easily leave your surroundings and escape the clutches of misery, but if you’re poor could you possibly have less options? What stops anyone from moving anyway? The study’s results are indeed strange. The only reasons I’d live in a rich neighborhood would be for good public schools and low crime. What are the stats for the opposite scenario of high-income people living in poor neighborhoods? I agree with Lin, in the modern era, we all need to know how to handle money better. I think that the above post does highlight one thing, being materialistic, if you can’t afford it, will kill you in the end. The world has gone materialistic mad, what car you drive, what house you have etc. I don’t even own a house and I’m a lot happier than many friends now staring in the abyss of negative equity! The important thing is that money should be used to keep your basic needs met. Living in a community of rich people won’t make a difference with those living in the slums. It all has something to do with making the best of what you have, and making more! Sadly, it is still a fact that those that can pay for medical bills and insurance without sweat are at better par when it comes to health.